Bury Markets - New Bury Market Promotional Video Coming Soon! New Bury Market Promotional Video Coming Soon! 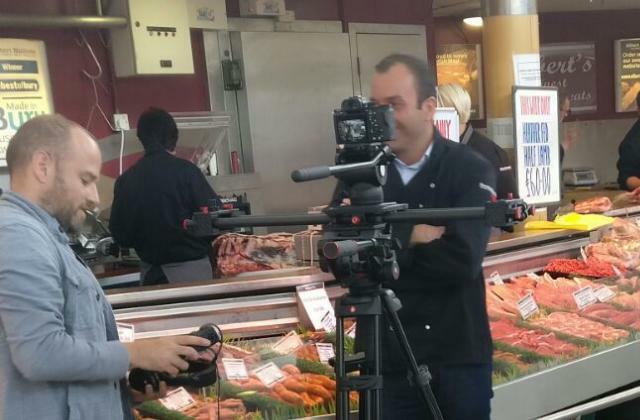 Filming took place on the Market on Wednesday 17 August to create a new promotional video. Spark Media brought their cameras to the Market to try to capture some of the atmosphere and variety on offer. As part of the filming Alex Shaw, Group Chef from Eat Pennines who boast the Multi-Award Winning Eagle and Child in Ramsbottom as part of their organisation came down to talk about the food available on the Market and why they source meat from Albert's Butchers. Also on hand was Chris Matthews, Director of Albert Matthews (pictured), to provide further insight into the Market and the range of quality meat products available from Albert's Stall in the Fish and Meat Hall. In addition the film will include examples of the vast variety of goods available on the Market, and a 'day in the life of a coach visit' which follows a coach trip organised by Voel Coaches from North Wales. The video content is eagerly awaited and will be available to Coach and other visitor groups to enable them to get a flavour for the Market before they visit. *Eat Pennines is a food focused social enterprise supporting disadvantaged young people from the Pennine region into employment with training in the horticultural, catering and customer service sectors. More details can be found on the eatpennines.com website.